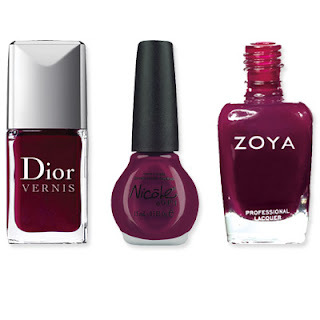 If you tend to get post-manicure buyer's remorse, wine is the shade for you. "It's a hard color to screw up. Almost every hue looks festive and classy," says celebrity manicurist Ashlie Johnson, who works with Kristen Stewart, Eva Mendes, Lea Michele and Kate Hudson, among others. Dior in Smoking Plum, $21; saks.com. Nicole by OPI in the Grape Debate, $7.99; ulta.com. Zoya in Stacy, $7; zoya.com.